There are a number of financial “rules of thumb” that can be applied to generating retirement income with retirement savings. Although there are many valid methods, one of the more popular strategies for those saving for retirement is the 1,000-Bucks-a-Month Rule. 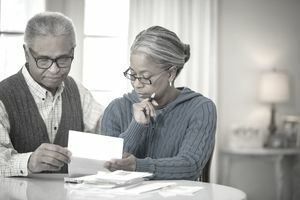 Based on the 1,000-Bucks-a-Month Rule, someone at “normal” retirement age (62-65) can plan on a 5 percent withdrawal rate from their investments. However, younger retirees in their 50s should plan on withdrawing a lower number than 5 percent per year, typically 4 percent or less. This is because if you retire in your 50s, there is too long of a time horizon to be able to withdraw 5 percent per year. In other words, you'll exhaust your savings at some point in your retirement. In years that the market and interest rates are in a typical historical range, the 5 percent withdrawal rate works well, assuming you're 62 years of age or older. But you must be willing to adjust your withdrawal rate lower in any given year the market experiences a downturn or correction. You will need to be flexible enough to adapt to the current economic environment. However, in good years, you may be able to withdraw a little extra money, as long as it's not too much. For every 1,000 bucks per month you want to have at your disposal in retirement, you need to have $240,000 saved. Why the Rule Is Important? Depending on the size of your income from Social Security, pension, or part-time work, the number of $240,000 multiples will vary. The rule itself won’t vary; the 1,000 Bucks-a-Month rule is a rule that is constant. For every $1,000 you want each month in retirement, it’s imperative you save at least $240,000. In a low-interest rate environment and in times when the stock market is volatile or fluctuates wildly, the 5 percent withdrawal rate can be most significant. It's important to note that the market can go for months or even years without a gain and the discipline surrounding the 5% withdrawal rate can help your savings last through those tough times. The are other factors to consider in order for the 5 percent withdrawal rate to have the greatest chances of being successful. In other words, you want to be able to withdraw 5 percent and not run out of money. Income investing is a way to generate consistent cash flow from your liquid investments. It comes from three places: dividends, interest, and distributions. If you have enough savings so that your cash flow allows you to withdraw 4 percent, then you're close to attaining a 5 percent withdrawal rate. Employing an income-investing strategy to generate a return each year on your portfolio is crucial to the success of the 1,000 Bucks-a-Month Rule. Income investing allows you to earn interest on your savings through bonds or other stable investments. As a result, your money has a better chance of lasting throughout your retirement. What if Your Retirement Lasts Longer than 20 Years? What if you earn zero interest on your money for period of time? Let's assume your retirement savings is invested in cash and yielding little to no yield. If you withdraw 5 percent while earning zero interest on your money, your funds will still last 20 years. A consistent 5 percent withdrawal amount per year x 20 years = 100 percent. However, in twenty years, your funds will have been exhausted. But what if your retirement lasts for 30 or 40 years? And what if you are planning on leaving something to your children? If you have a portfolio yield of 3 to 4 percent (dividends and interest only) and the portfolio experiences a small percentage of growth or appreciation, you may be able to withdraw 5 percent or more. For example, if your portfolio is earning a 4 percent yield from interest and dividends and the markets rise yielding an additional 3 percent in capital gains, withdrawing 5 percent would be well below your annual gain of 7 percent for the year. Any gains in the markets can help boost your portfolio and increase your chances of being able to withdraw 5 percent per year over an extended period of time. The 1,000 Bucks-a-Month Rule is a variation of the 4 percent rule, which has been a financial planning rule of thumb for many years. The 4 percent rule was first introduced by William Bengen, a financial planner who declared that retirees could deduct 4 percent from their portfolio every year (in addition to adjusting up for inflation) and not run out of money for at least 30 years. Analysts and academics verified Bengen’s data and supported his assertion. He said that retirees who had a mix of 60 percent stocks and 40 percent bonds, and lived on 4 percent or so each year, would never have to worry about running out of money. The 1,000 Bucks-a-Month Rule is a guide to help you plan how much to save as you're accumulating wealth for retirement in increments of $240,000. It's also a guide to help make sure you don't withdraw too much in your retirement years. To recap: For every 1,000 bucks per month in income in retirement, you need to have $240,000 saved. This easy-to-follow bit of wisdom can help you remember that you're saving money so that one day it can replace the income stream you will lose when you stop working. Disclosure: This information is provided to you as a resource for informational purposes only. It is being presented without consideration of the investment objectives, risk tolerance, or financial circumstances of any specific investor and might not be suitable for all investors. Past performance is not indicative of future results. Investing involves risk including the possible loss of principal. This information is not intended to, and should not, form a primary basis for any investment decision that you may make.